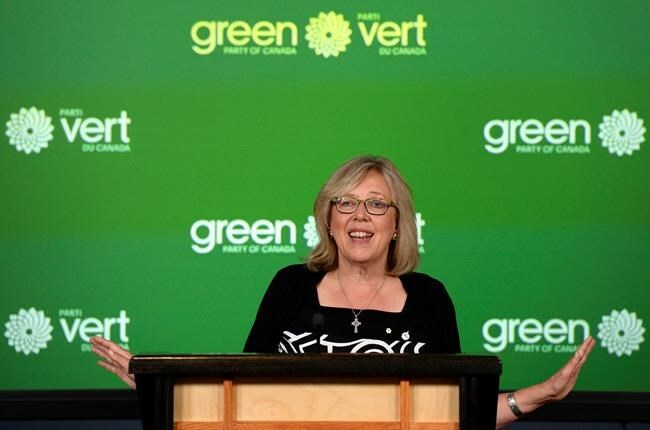 OTTAWA — Elizabeth May will remain Green party leader despite a controversy over the Middle East that divided members and prompted her to consider stepping down. The party will revisit a convention resolution to support a movement to boycott Israel, along with any other recent policy decisions that lacked genuine consensus, May told a news conference Monday. Meantime, May will focus on her work as a member of a parliamentary committee studying options for remodelling Canada's electoral system before the next national ballot in three years. "This is a decision that I think the party needs as we build our strength, and as I work on electoral reform and we prepare for 2019," May said. May, the lone Green MP, spent the last several days pondering her future during a vacation in Cape Breton. At the party's convention earlier this month, members voted to express support for the so-called boycott, divestment and sanctions (BDS) movement against Israel — a move May opposed and which Jewish groups swiftly denounced. May has attributed the resolution's passage to the process — brief statements followed by a majority vote rather than the party's traditional approach of a concerted effort to arrive at consensus. "We let ourselves down, and I take blame for that myself," she said Monday. May called the party's recent troubles a "teachable moment" and said her belief in consensus applies to both how the party forms policy and national electoral reform. "Consensus decision-making works better than winner-take-all decision making. It will work better for the electoral system of Canada and it worked better for the Green party of Canada," she said. "So what I've decided is that the reasons for staying are far more compelling." May firmly squelched suggestions she had thought about joining the NDP or the Liberals. "That was never even a consideration." She was "overwhelmed to read so many letters of support" from Green members, non-members and fellow MPs. She said media commentary made her feel like Mark Twain's Tom Sawyer, attending his own funeral. "It appears I am much loved — it's surprising to find sometimes in politics." May said she briefly thought exiting as party chief would give her more independence and credibility on electoral reform, since the Greens stand to benefit from replacing the current first-past-the-post balloting system. She decided to remain leader only after meeting with the party's federal council late Sunday evening, May said. "It came to a question of support and unity. The council overwhelmingly wants me to stay on as leader." The council adopted a motion approving a special meeting of party members — details to be announced later — where "improved processes for policy-making" are to be adopted. In addition, the party is eyeing a return to its pre-2016 process of holding a ratification vote open to all members for any policy adopted at a convention or general meeting. "It's a critical issue to me that we return to consensus-based decision-making," May said. "And council completely supports me in making that effort."